So, you've opened up your quilting business? You're in a good location, provide a superior product and offer compelling prices. Yet, somehow, you'd like to see more people frequenting your quilt shop or signing up for your quilting classes, taking advantage or your machine quilting services, or purchasing your quilts. One way to achieve your quilting business goals is to write articles. If you've never fancied yourself as much of a writer, don't worry. If you've got news, there's a good chance that someone will want to read it, and therefore, your local paper will want to publish it. The obvious question is: “How do I get started?” Well, it's a lot easier than you may think. First of all, you need to have a newsy and interesting angle to your potential story – the kind of thing editors will be glad to publish. 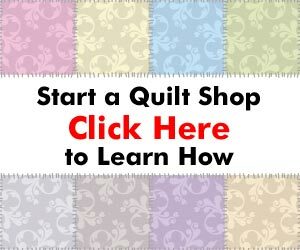 Are you a brand new quilting business, perhaps the first in town? Do you provide special workshops on quilt making? Have you expanded your quilting product or service offerings? Have you contributed qulits to a noteworthy cause? Do you use unusual fabrics to make your quilts? Does your machine quilting business offer special services? Have you ever sold a quilt to a celebrity? If you can answer “Yes!” to any or all of these questions, then you can potentially write an article that would be of interest to an editor at one of your local papers. There are two ways you can go about writing an article for your quilting business. The first option is if you write the article and then ask the editors at your local papers whether or not they would be interested in publishing it. The second option would be to first contact local editors and ask if they would be interested in your article if you write it. Option two is the better of the options because you can determine if there's interest before spending your time writing the article. And, because many local papers are understaffed (and underpaid), they will welcome having some great local news written for them. You most likely will not be paid for your efforts, but that isn't as important as getting publicity that will prompt people to visit your quilt shop, call you for machine quilting services, or get people to buy your quilts. But what if writing isn't your forte? If this is the case, you have a few options. First, you could ask someone to write the article for you. Many journalism students, for instance, would be happy to add another article to their portfolio. And they might be willing to accept a letter of recommendation over payment. Second, you could simply call the editor and explain why he or she should assign a writer to do a story about your quilting business. If you're pitch entices the editor, you just may be featured in an upcoming edition of the paper. An article in your local paper can certainly generate more traffic and sales for your quilting business. You've simply got to make sure you provide an interesting story that the editor of your local paper will want to share with his readers. What is the best way to market the use of an accu-cut machine without marketing a class to highlight it’s functionality? We want to use it for rental – charge $8-10 an hour to rent out to our customers. Any good ideas?